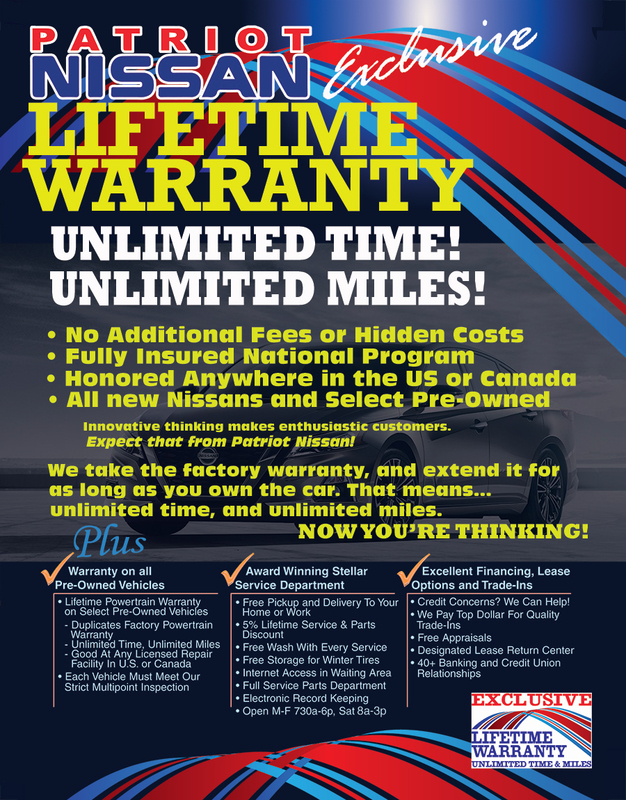 Patriot Nissan's Exclusive Lifetime Warranty is provided on every new Nissan we sell, plus qualifying pre-owned vehicles. We take the factory warranty, and extend it for as long as you own the car. No additional fees or hidden costs. This is an added value program from Patriot. You can service anywhere in the U.S. or Canada to keep the warranty intact. Simply follow the manufacturer's basic service maintenance schedule that comes in the owner's manual. We certainly hope you use Patriot's award winning service team, but if you move to Florida - the warranty stays with you!